The Alhambra Decree (also known as the Edict of Expulsion) was an edict issued on 31 March 1492, by the joint Catholic Monarchs of Spain (Isabella I of Castile and Ferdinand II of Aragon) ordering the expulsion of practicing Jews from the Kingdoms of Castile and Aragon and its territories and possessions by 31 July of that year. The primary purpose was to eliminate their influence on Spain's large converso population and ensure they did not revert to Judaism. 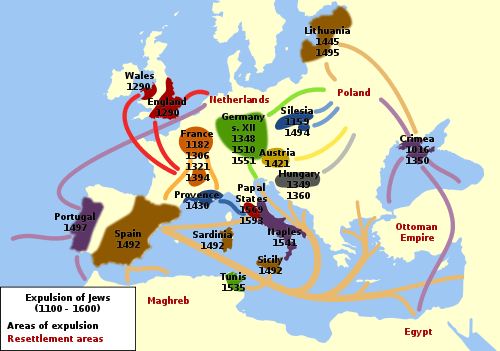 Over half of Spain's Jews had converted as a result of the religious persecution and pogroms which occurred in 1391, and as such were not subject to the Decree or to expulsion. A further number of those remaining chose to avoid expulsion as a result of the edict. As a result of the Alhambra decree and persecution in prior years, over 200,000 Jews converted to Catholicism and between 40,000 and 100,000 were expelled, an indeterminate number returning to Spain in the years following the expulsion. The edict was formally revoked on 16 December 1968, following the Second Vatican Council and a full century after Jews had been once more been allowed to openly practice their religion in Spain and synagogues being allowed to be used as places of worship under Spain's Laws of Religious Freedom. In 2014, the government of Spain passed a law allowing dual citizenship to Jewish descendants who apply, in order to "compensate for shameful events in the country's past." Thus, Sephardi Jews who are descendants of those Jews expelled from Spain due to the Alhambra Decree, and can prove it, can "become Spaniards without leaving home or giving up their present nationality." Beginning in the 8th century, Muslims had conquered and settled most of the Iberian Peninsula. Jews, who had lived in these regions since Roman times, were considered "People of the Book" and given special status and often thrived. The tolerance of the Muslim Moorish rulers of al-Andalus attracted Jewish immigration, and Jewish enclaves in Muslim Iberian cities flourished as places of learning and commerce. The Reconquista, the gradual reconquest of Muslim Iberia by the Christian kingdoms, was driven by a powerful religious motivation: to reclaim Iberia for Christendom following the Umayyad conquest of Hispania centuries before. By the 14th century, most of the Iberian Peninsula (present-day Spain and Portugal) had been conquered by the Christian kingdoms of Castile, Aragon, León, Galicia, Navarre, and Portugal. Overt hostility against Jews became more pronounced, finding expression in brutal episodes of violence and oppression. Thousands of Jews sought to escape these attacks by converting to Christianity; they were commonly called conversos, New Christians, or marranos. At first these conversions seemed an effective solution to the cultural conflict: many converso families met with social and commercial success. But eventually their success made these new Catholics unpopular with some of the clergy of the Church and royal hierarchies. These suspicions on the part of Christians were only heightened by the fact that some of the coerced conversions were undoubtedly insincere. Some, but not all, conversos had understandably chosen to salvage their social and commercial positions or their lives by the only option open to them – baptism and embrace of Christianity – while privately adhering to their Jewish practice and faith. These secret practitioners are commonly referred to as crypto-Jews or marranos. The existence of crypto-Jews was a provocation for secular and ecclesiastical leaders who were already hostile toward Spain's Jewry. The uncertainty over the sincerity of Jewish converts added fuel to the fire of antisemitism in 15th century Spain. The hostility toward Jews was brought to a climax by the "Catholic Monarchs" Ferdinand and Isabella, whose marriage in 1469 formed a personal union of the crowns of Aragon and Castile, with coordinated policies between their distinct kingdoms. Ferdinand and Isabella were disturbed at reports that most Jewish converts to Christianity were insincere in their conversion, continued to practice Judaism in secret (see Crypto-Judaism), and were trying to draw other conversos back into the Jewish fold. In 1478, Ferdinand and Isabella made formal application to Rome for a tribunal of the Inquisition in Castile to investigate these and other suspicions. In 1487, King Ferdinand promoted the establishment of the Spanish Inquisition Tribunals in Castille; in Aragon, it was first instituted in XIII century to combat the Albigense heresy. The independent Islamic Emirate of Granada had been a tributary state to Castile since 1238. 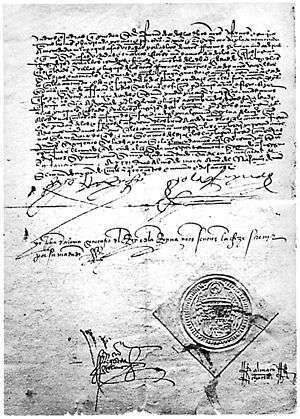 In 1491, in preparation for an imminent transition to Castilian territory, the Treaty of Granada was signed by Emir Muhammad XII and the Queen of Castile, protecting the religious freedoms of the Muslims there. In 1492, Ferdinand and Isabella completed the Catholic Reconquista of the Iberian Peninsula from Islamic al-Andalus by victory in the Battle of Granada. The king and queen issued the Alhambra Decree less than three months after the surrender of Granada. This was primarily a decision of Isabella, not her husband Fernando. That her confessor had just changed from the tolerant Hernando de Talavera to the very intolerant Francisco Jiménez de Cisneros suggests that Cisneros may well have had a role in Isabel's decision. In it, Jews were accused of trying "to subvert their holy Catholic faith and trying to draw faithful Christians away from their beliefs." These measures were not new in Europe. Some Jews were only given four months and ordered to convert to Christianity or leave the country. Under the edict, Jews were promised royal "protection and security" for the effective three-month window before the deadline. They were permitted to take their belongings with them – except "...gold or silver or minted money or other things prohibited by the laws of our kingdoms...". The punishment for any Jew who did not convert or leave by the deadline was summary execution. The punishment for a non-Jew who sheltered or hid Jews was the confiscation of all belongings and hereditary privileges. The Spanish government has actively pursued a policy of reconciliation with the descendants of its expelled Jews. In 1992, in a ceremony marking the 500th anniversary of the Edict of Expulsion, King Juan Carlos (wearing a skullcap) prayed alongside Israeli president Chaim Herzog and members of the Jewish community in the Beth Yaacov Synagogue. The King said: "Sefarad (the Hebrew name for Spain) is no longer nostalgia, but a place where Jews should not be told to feel as if at home [a customary greeting to guests in Spain], because Hispano-Jews are at home in Spain. What matters ... is the desire to analyse and project the past in regards to our future." From November 2012 Sephardi Jews have had the right to automatic Spanish nationality without the requirement of residence in Spain. Prior to November 2012, Sephardi Jews already had the right to obtain Spanish citizenship after a reduced residency period of two years (versus ten years for foreigners). While their citizenship is being processed, Sephardi Jews are entitled to the consular protection of the Kingdom of Spain. This makes Spain the only nation that currently grants automatic citizenship to the descendants of Jews expelled during the European medieval evictions. As of November 2015, 4300 Sephardi Jews have benefited from this law and acquired Spanish citizenship, swearing allegiance to the Spanish Constitution. In 2013, the number of Jews in Spain was estimated to range between 40,000 and 50,000 people. 1 2 3 "Edict of the Expulsion of the Jews (1492)"
↑ Menocal, María Rosa (2002). The Ornament of the World. ...and were often butchered under Muslim rule but certainly lived under oppressive second class citizen conditions. ↑ Anti-Semitism. Jerusalem: Keter Books. 1974. ISBN 9780706513271. ↑ "Map of Jewish expulsions and resettlement areas in Europe". A Teacher's Guide to the Holocaust. Florida Center for Instructional Technology, College of Education, University of South Florida. Retrieved 9 September 2016. ↑ Elliott J. H. "Imperial Spain 1469-1716", St. Martin's Press, 1964. ↑ Eisenberg, Daniel (1993) . "Cisneros y la quema de los manuscritos granadinos". Journal of Hispanic Philology. pp. 107–124. Retrieved 9 September 2016. ↑ Flores, Carlos; Maca-Meyer, Nicole; González, Ana M; Oefner, Peter J; Shen, Peidong; Pérez, Jose A; Rojas, Antonio; Larruga, Jose M; Underhill, Peter A (2004). "Reduced genetic structure of the Iberian peninsula revealed by Y-chromosome analysis: implications for population demography". European Journal of Human Genetics. 12 (10): 855–863. doi:10.1038/sj.ejhg.5201225. ISSN 1018-4813. PMID 15280900. ↑ "Mitochondrial DNA affinities at the Atlantic fringe of Europe". Am. J. Phys. Anthropol. 120 (4): 391–404. April 2003. doi:10.1002/ajpa.10168. PMID 12627534. ↑ "Y chromosomal haplogroup J as a signature of the post-neolithic colonization of Europe" (PDF). Hum Genet. 2004. Retrieved 9 September 2012. ↑ "Toward resolution of the debate regarding purported crypto-Jews in a Spanish-American population: Evidence from the Y chromosome". Ann. Hum. Biol. 33 (1): 100–11. 2006. doi:10.1080/03014460500475870. PMID 16500815. ↑ "Identifying Genetic Traces of Historical Expansions: Phoenician Footprints in the Mediterranean". The American Journal of Human Genetics. Elsevier Inc. 17 November 2008. Retrieved 9 September 2016. ↑ Yanes, Javier. "Tres culturas en el ADN" [Three cultures in DNA] (in Spanish). Archived from the original on 21 July 2012. Retrieved 9 September 2016. [English translation] The Sephardi result may be overestimated, since there is much diversity in those genes and maybe absorbed other genes from the Middle East. Puts Calafell in doubt the validity of ancestry tests? They can be good for the Americans, we already know from where we come from. ↑ Hesman Saey, Tina (4 December 2008). "Spanish Inquisition couldn't quash Moorish, Jewish genes". Retrieved 9 September 2016. We think it might be an over estimate. The genetic makeup of Sephardic Jews is probably common to other Middle Eastern populations, such as the Phoenicians, that also settled the Iberian Peninsula," Calafell says: "In our study, that would have all fallen under the Jewish label. ↑ Cáceres, Pedro (10 December 2008). "Uno de cada tres españoles tiene marcadores genéticos de Oriente Medio o el Magreb" [One in three Spaniards have genetic markers for Middle East and the Maghreb] (in Spanish). Retrieved 9 September 2016. [English translation] Dr. Calafell clarifies that ... the genetic markers used to distinguish the population with Sephardi ancestry may produce distortions. The 25% of Spaniards that are identified as having Sephardi ancestry in the study could have inherited that same marker from older movements like the Phoenicians, or even the first Neolithic settlers thousands of years ago. ↑ Callaway, Ewen (4 December 2008). "Spanish Inquisition left genetic legacy in Iberia". New Scientist. ↑ Cembrero, Ignacio (1 April 1992). "El Rey celebra en la sinagoga de Madrid "el encuentro con los judíos españoles"" [The King celebrates the "meeting with Spanish Jews" in the Madrid synagogue] (in Spanish). Retrieved 9 September 2016. ↑ Minder, Raphael (22 November 2012). "Spain: Citizenship Process Eased for Sephardic Jews". The New York Times. ↑ "El Rey, a los sefardíes: "¡Cuánto os hemos echado de menos!"" [The King, the Sephardim, "How I've missed you!"] (in Spanish). El País. 30 November 2015. The Edict of Expulsion of the Jews – English translation of the decree (from Castilian).